Pancakes are great, but we can’t forget about their close cousin, waffles. If you own a waffle iron and thought you would never use it again and that it would just keep on accumulating dust, then this recipe is for you! Granted, they are another one of those indulgences and not shy on the nut flours, but if you are one of those who would rather have some treats in moderation, then there is nothing wrong with them. The batter itself is low in sugar, but still tangy and delicious, thanks to the addition of the grated Granny Smith apple. You can prepare the liquid portion of the batter and leave it in the refrigerator overnight so that they are ready very quickly the next morning for a lazy Sunday morning treat. SERVES: 4 PREP: 20 min. COOK: 15 min. Combine together the almond flour, tapioca starch, coconut flour, cinnamon, salt and baking powder. Combine together the egg yolks, vanilla, coconut milk, apple and melted ghee and mix in with the dry ingredients to form the batter. Add the egg whites to a bowl and beat with a hand mixer just until soft peaks form. Use a spatula to fold in the batter with the egg whites gently, just until the whites are all incorporated with the mixture. 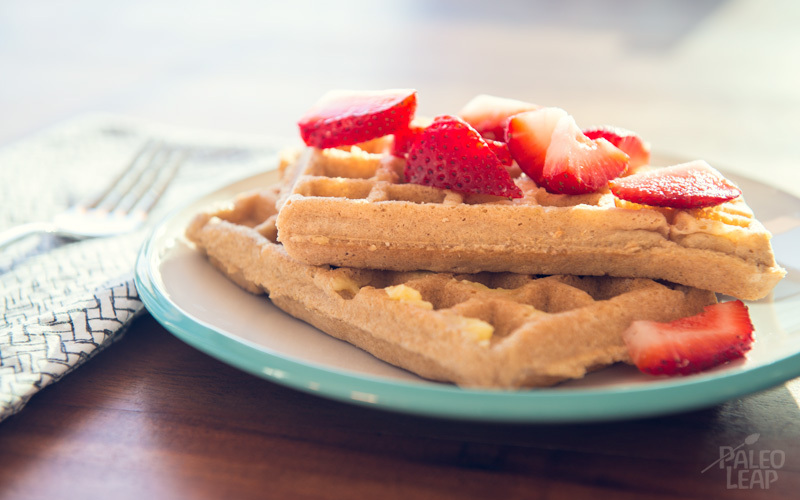 Lightly grease your preheated waffle iron with some extra ghee and add just enough waffle batter to cover your iron. Cook for about 2 to 3 minutes, until golden and easy to separate from the waffle iron. Repeat for the remaining waffle batter. Serve hot with more ghee, fresh fruits, and maple syrup or honey, if you fancy some extra sweetness.